Six ladies enjoyed their first day of the Get into Golf programme at the Glen with Fraser on a bright sunny Saturday morning. Eighteen Ladies turned out for the Texas Scramble on Sunday, 10th February. It was a beautiful day and all the Ladies enjoyed the course and the competition. 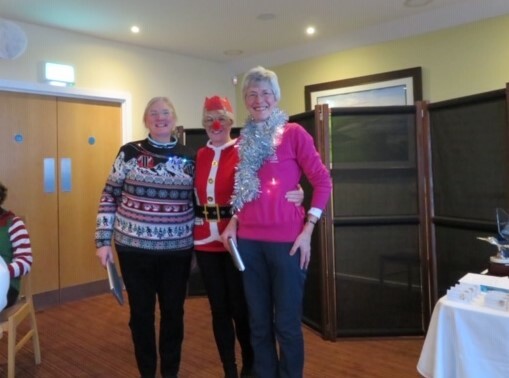 Our runners up were Margaret Wellward, Marion Currie and Ann Wild. The winners with a nett 64.2 were Barbara Baikie, Karin Milivoyevich and Ali Carslaw, who won umbrellas! However, the highlight of the day was a hole in one on the 4th for Karin. Witnessed by Christian Blake on the 5th tee, Karin couldn’t understand why the 3 in front were jumping up and down, until the penny finally dropped! Congratulations to Karin, on her hole in one, her third!!!! At the Ladies Section AGM on 7th February the Lady Captain presented a cheque for £300 to Lesley Kaye from the North Berwick Youth Project, which was the Ladies nominated charity for 2018. Lesley was delighted to accept the donation which will be used to support a variety of activities for young people in North Berwick. The money was raised thanks to the generosity of Glen Ladies and our friends from other Clubs through raffles and social events. Thanks to all the ladies who turned up for breakfast 🍳 before our usual Monday turn up. Good company, food and chat. We plan to make this a monthly event over the winter. Well done to all the Ladies who collected their prizes at Prize Giving on Saturday 20th October. It's been a great season and we've played in some great conditions. If you didn't pick up a prize this year, bad luck, there's always next year! Great turnout,Fun golf, good company and great food. Our Ladies hosted Murrayfield ladies for a friendly match on Monday, 3rd. It was a horrid morning but after a democratic vote it was decided the match would go ahead. 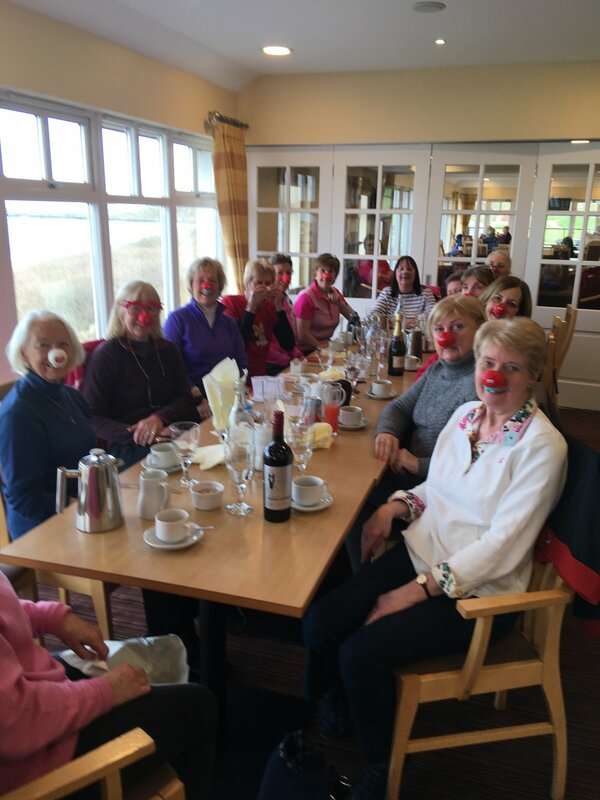 They bravely played 12 holes before deciding enough was enough and retiring to the Clubhouse for some well-earned refreshments. Hopefully, the Murrayfield ladies will come back on a nicer day to day to enjoy our beautiful course and views. It’s been a busy week for the Glen Ladies! On Wednesday 5th we had our second Nine and Dine – a fun competition followed by a meal in the Clubhouse. Ladies played a Tex-Mex Scramble in warm, calm conditions. The meal afterwards was a lively affair concluded by singalong to the Nine and Dine singing golf bag trophy! Winner were Janice, Isabel and Geri – look after that trophy girls! On Saturday 8th 20 Ladies went to Eyemouth Golf Club to play in their open Texas Scramble. The course came under scrutiny as we enjoyed coffee and bacon rolls. When we saw dots on the horizon that we realised were other golfers we recognised the challenge ahead of us. It’s fair to say we all had a good walk! The course was long and the greens challenging but the weather was kind and well supplied with biscuits and jelly babies we all made it around. The day concluded with a lovely meal and presentation of prizes. Whilst we weren’t in the running for the open competition prizes the Violet Bowl for the Glen Challenge was won by Anne (Wood), Marlene, Karin and Nance. Runners up and winners of the super hard quiz were Margaret (Wellwood), Margaret (Ross), Barbara and Ann (Nimmo). In case you missed the e-mail updates the Summer Fours and Dickson Trophy competitions have concluded. The Summer Foursomes were won by Ali Carslaw and Brenda Goldstein. Worthy runners up were Nancy Thorne and June Elliott. The Dickson final was played on 5th between Anne Wood and Nancy Thorne. After a close match Nancy won on the 17th. Congratulations to our winners, commiserations to our runners up and well done to everyone who took part. The Glen Ladies 5-a-side team welcomed Musselburgh for the second match in the Carols Trophy on Tuesday. We had a few light showers but not enough to put a dampener on the matches which were all well contested to the 17th or 18th. Despite our best efforts Musselburgh Ladies took 4 matches to our 1. Better luck next time. The Glen Ladies hosted their second friendly game with Royal Musselburgh GC on Wednesday 6th June. A beautiful evening, good golf and our visitors were very complementary about the course and the catering. Our first friendly match of the season was against Dirleton Castle Ladies on Gullane No.2. The result was all square, 1 won, 1 drawn and 1 lost, congratulations to all the ladies. What could be better a warm evening, great golf and supper at the Mallard. 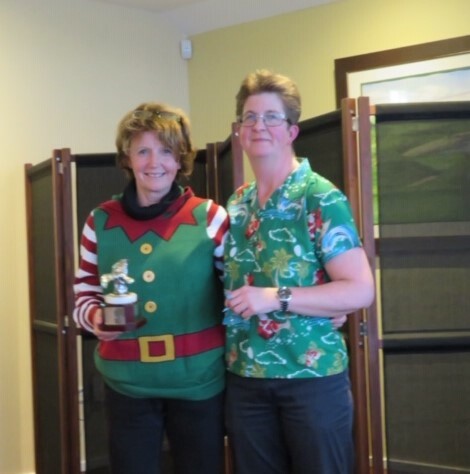 Marion Currie and Barbara Baikie played at West Linton GC in the SGU Revive Active Scottish Women’s Regional Medal Final. Both played well and Marion has qualified for the final to be played at the Duke’s St Andrews in June. The Golf Fashion Soiree held at the club 17th May was a great success. Over 30 ladies from the Glen and other local clubs came along to spend their money and enjoy a social evening. We raised over £100 and Fraser secured plenty of sales. We hope to repeat this event next year.